We loved working with this couple. They had such a wonderful day! They also had a great planner to help keep everything on track. Katie and Hunter chose to use us for most of the day with two photographers. This allowed us enough time to capture details, getting ready, ceremony, portraits and their special events without rushing through the day. We started the day out with the pre-ceremony shots. I was able to work with the bride, her attendants and family. We were not only able to capture getting ready photos but we were also able to get some of the family portraits done before the ceremony as well as bridal party portraits. I was able to capture Katie with her family and bridesmaids while Doug worked with the groom, his family and groomsmen. This allowed the bride and groom to get to their reception faster after the ceremony, combined family portraits and romantic portraits were finished. Katie and Hunter got to say their I do’s in front of their closest friends and family on the beaches of the Outer Banks in Corolla, NC. The ceremony was beautiful! They decided to keep their ceremony simple and reserve a few minutes afterward for themselves to spend time together in their first moments as husband and wife. A table with congratulatory drinks was set aside for them in the gazebo with champagne to celebrate. Shortly after their time together we were able to gather everyone for a group photo and then finish up with the rest of the family and bridal party portraits, so that we could focus on the couples intimate session. Katie & Hunter were so fun to photograph. You can see the love they have for each other in every photo. They were so expressive. I was so happy to know that we would be spending another day together shooting a trash-the-dress session. I will have those photos in another post. While I was working hard on the beach, Doug was working hard to capture the details of the reception and the cocktail hour. 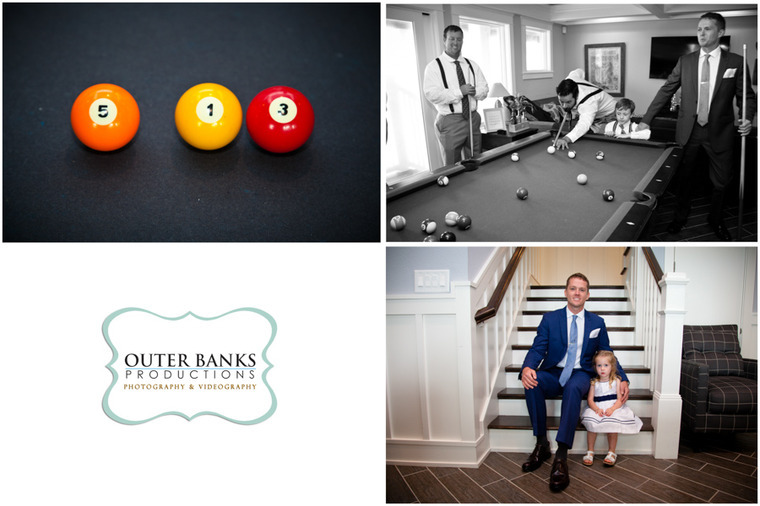 He was able to keep himself out of site and capture the guests making memories and the details. This allows the guests to enjoy themselves without feeling like they have to perform for the camera. The bride and groom joined everyone for cocktail hour for a little bit before the reception started. The bride and groom focused on their time with family during the reception. They were able to keep their reception moving at a good pace with the help of the day of planner Heather from Premiere Events. The reception was started off with dinner. While everyone was finishing up dinner the toasts began. I always love this approach as everyone is still in their seats and you don’t have to disrupt the party to get the events started. Shortly after the toasts the desert bar and cake cutting took place. It is so fun when the couple is playful! The final events of the evening ended with the dances and then to an open dance floor. Each dance was so emotional and thoughtful. It was truly a memory filled day. Don’t forget to check out our trash-the-dress session with this lovely couple in our next blog post. Coming soon! The day started off with heavy rain showers. Doug headed to the guys house in the Tuckahoe neighborhood of Duck,NC. I met up with the bride and bridesmaids at the event home in Kill Devil Hills. Despite the wet weather everyones spirits were high. As we neared the end of photographing everyone getting ready the rain stopped. We were able to get the ceremony in before it started to drizzle again. We also got some family portraits in on the beach before the rain got heavy again. We took some pictures in the cabana with the bridal party and as we finished them up we got another break in the rain. We were able to sneak out to the beach again to get some gorgeous romantic photos with Sydney and Stefan. The rain stopped at the beginning of the reception and the planners were able to set up the tables and chairs for the reception. The rest of the night was perfect and beautiful. The couple ended the night jumping in the pool with their bridal party! 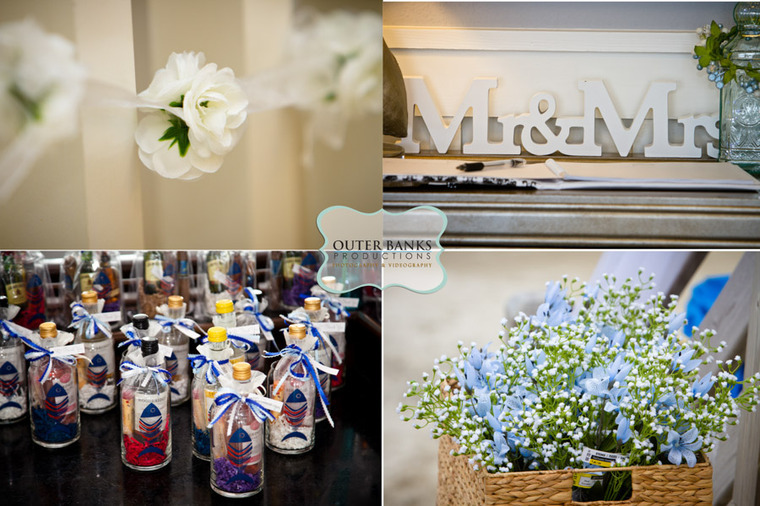 Please come visit Outer Banks Productions at the 2018 Wedding Weekend Expo January 13, 14, 2018. Hours are 9 am to 2 pm each day. Outer Banks Productions can be found in gym of the First Flight High School at booth 101. 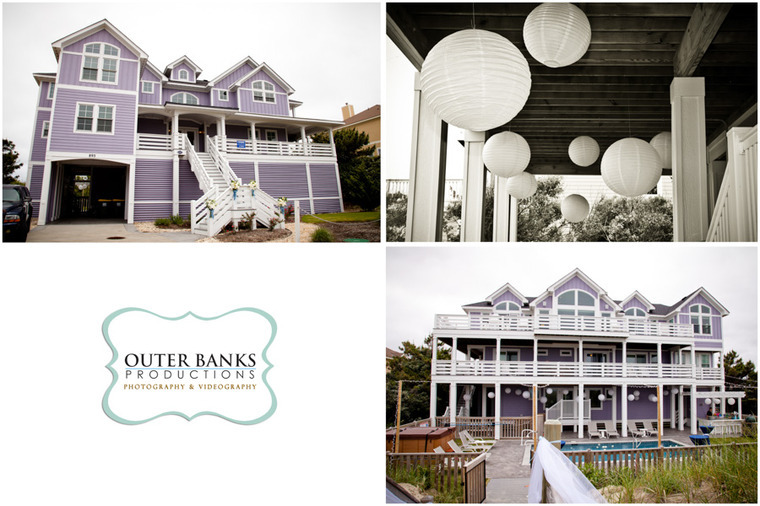 Outer Banks Productions will be offering our best specials of the year and will also have a free drawing for over $4500.00 worth of amazing prizes including free photography and wedding albums! See prize list at the bottom of this page. See you there! Drawing will be held 2 weeks after the show & listed on our website. Details: 1 photographer. DVD with up to 500 images. On-line viewing. Must be used before December 31 of the winning year. Details: Black cover. Upgrades available. Cameo Cover-Not Available. 10 page (20 sides) you must provide us the images before November 1 of the winning year. Retail: $299.00 Retail total may be used to upgrade! Details: Outer Banks, Coquina Beach. 1 hour. 1 photographer. Top images on DVD. On-line proofing. Must be used before December 31 of the winning year. Retail: $399.00. Retail total may be used to upgrade! Details: 100-4×6 prints, 2-8×10 prints, 2-5×7 prints. Images from non-customers must be sent to us on CD/DVD in high resolution. Image must be in .JPG format. Must have images to us before November 1 of the winning year. Retail: $249.99. Retail total may be used to upgrade! Details: Send us up to 50 images, 10 text statements. Images from non-customers must be sent to us on CD/DVD in high resolution. Image must be in .JPG format. You must provide us the images before November 1 of the winning year. Retail: $199.99. Retail total may be used to upgrade! *All prizes have no cash value. Substitutions and upgrades may be available. Free Mileage. Outer Banks area only. Corolla to Hatteras. Based on availability. Restrictions apply.